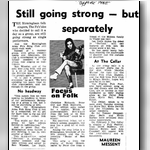 THE Birmingham folk singers, The Fo’c’sles who decided to call it a day as a group, are still going strong as single performers. And the Birmingham Arms Folk Song Club still meets each week. Instead of a resident group, with group commitments and rehearsals, the club is entertained by several former members of the group, now singing as individuals. Ron Wheeler, one of the men who sang with, and put in a lot of hard work for, the Fo’c’sles was resigned to the group’s split-up. “It is just a process of evolution,” he said. “We were spending too much time on club organisation, and not enough on the group. “This meant that we were making no headway in terms of our performance. Belonging to a group is fun, but it can be stultifying as well. “Now the Birmingham Arms Folk Song Club is run by a committee, we all get far more time to dig out and travel out to collect folk songs. And to prove that ‘the Birmingham Arms faction is still thriving, it has its own charter of liberty. Christine Richards, Peter Coe and Mick Bosworth. First edition sales called for a reprint. Which is understandable. Because from the Look of its first issue, “Garland” could be a winner. Not contrived, folksy, not a biblically solemn pamphlet, the mag has ‘a good bit of each for all. This song is from the singing of Sarah Makem, learnt by Peter Coe from a friend of the Makem family in Tralee last year. 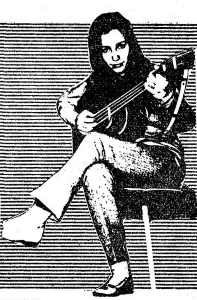 Les Ivalls makes his debut in “Garland~’ with two features on folk lore. He should know a bit, too. As one group calls it a day, another starts out in the club which Maurice Warner (he runs the Old Crown Folk Club, Digbeth and the Red Lion Folk Club in Kings Heath), hopes will soon be on its feet. The Pilgrim Folk Four, who have already sung at the Old Crown and the Red Lion, are to become as near residential as their studies allow at the Cellar Folk Club, Kyrle Hall, Sheep Street. The Cellar, which is to meet every Tuesday evening, has Steve Day, Blake Derrick and Joe Chambers as its other residents. So far Tommy Dempsey, John Swift and Hylda Harbey have promised occasional appearances. On February 3 The Cellar Is staging a Folk Festival. Then Derek McEwan, the Grehan Sisters and Alex Campbell will appear with the residents and as occasionals.